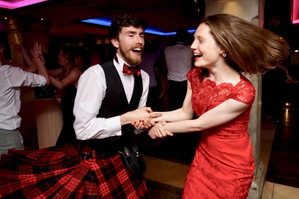 Point Five is a Scottish band that brings a fresh, creative approach to traditional Scottish music, sure to put a spring in your step for a memorable event. We play for weddings, conferences and private parties, as well as regular gigs. Our full lineup includes three fiddles, piano, guitar and dance caller, ​adjustable according to your needs and budget. We're based in Glasgow, but have played from the Shetland Islands​ down to the North of England. Have a look at our reviews, and also see our facebook and twitter pages for ​latest news and pics. New! We've started a blog! See our other pages for information on the band members, ceilidh information, music samples and more. Business Address:48 Partickhill Road,Glasgow,Strathclyde,G11 5AB,GB |Email: pointfiveceilidh@gmail.com.